Oh, those stairs. 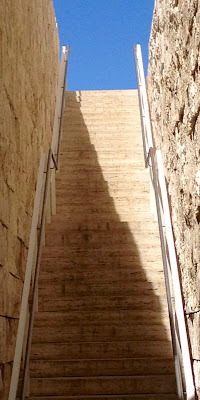 Steep and straight with no exit left or right should the climb become too much. Up OR down. Or, not at all. Eyes and imagination alone taking the trip. And that diagonal line slicing the incline in half, the brilliant light above, so inviting, so enticing; the dark shadow below, providing respite from the day's heat. Or perhaps, a foreboding of what lies up there in the beyond. What is at the top, if indeed that is the top? Is whatever 'it' is, worth the climb? the power of architecture + the play of light and shadow to evoke essential questions about the lives we create for ourselves. Do I know where I'm headed and more importantly, why? Who can I, do I, want to be and what can I, do I, want to do? Am I willing to take risks, to challenge myself to the end despite the effort required, my fears of failure, naysayers and the unknown? When climbing, if I discover a compelling 'no', am I willing to stop, review and retreat? What will it cost me if I don't climb at all? PLEASE SHARE: How about you? What or who inspires you to reflect? What or who drives you to say 'yes' or 'no' to a climb? How do you address challenges on your climb? What is a climb worth taking?